In a small country like ours, conflicts of interest in our working lives are natural and unavoidable. Having a conflict of interest doesn’t necessarily mean that someone has done something wrong, and it need not cause problems. It just needs to be identified and managed carefully. Conflicts of interest arise all the time. Usually, they cannot be avoided, so need to be managed. A poorly managed conflict can create legal risks and reputation risks. Managing conflicts of interest is a fundamental part of good public sector administration. There are rules to follow and expectations to meet. The rules are set out in a range of different statutory and common law rules, and the expectations are based on ethical behaviour. To cover the ethical aspects, it helps greatly if people take a principled approach to conflicts of interest. Having a conflict of interest doesn’t necessarily mean that someone has done something wrong, and it need not cause problems. It just needs to be identified and managed carefully. Public perceptions are important. It is not enough that an official is honest, they must be seen to be so. Despite careful management, some actions just might look bad. Our guidance is not just for senior managers and their advisors. It is relevant to all people who are members of, or who are employed by, a public organisation. 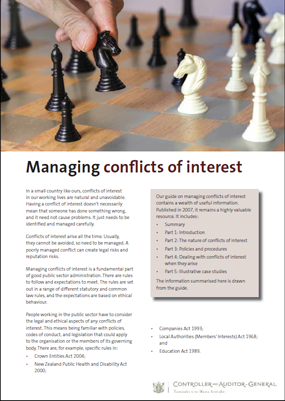 Personnel at all levels of a public organisation might need to identify and disclose conflicts of interest, or help to manage conflicts of interest. Is there something about you or someone close to you that could mean you might be seen as not being impartial or as having a closed mind on the decision? Managing conflicts of interest is particularly important in maintaining the integrity of the public sector. Where activities are paid for by public funds or are carried out in the public interest, members of Parliament, the media, and the public will have high expectations. They expect people who work in the public sector to act impartially, without any possibility that they could be influenced by favouritism, or improper personal motives, or that public resources could be misused for private benefit. We have a specific role in relation to financial conflicts of interest that are regulated by the Local Authorities (Members’ Interest) Act 1968. We strongly recommend that elected councillors and council staff read our good practice guide on the Local Authorities (Members' Interest) Act. We have no formal role in administering non-financial conflicts of interest. However, as the auditor of all public entities, we have an interest in encouraging all public entities to carry out their activities lawfully and responsibly, and we can use our inquiries powers if need be. The State Services Commission also has a role and has useful links and information in the Integrity and conduction section of its website.